This was me today taking a 'SERIOUS I want to pretend I am in a movie' shot, I just kind of look dumb but whatever. 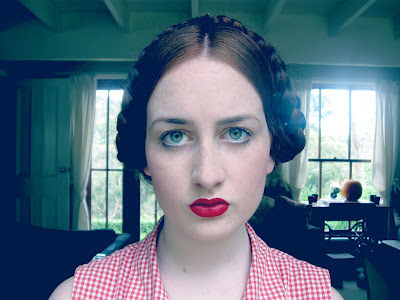 I did a silly 'Heidi' hairdo which was fun. I think I'll wear my hair like that to work tomorrow and see what people say. I wore my citrus dress to work the other day and got told I looked like a fruit bowl. Wearing my 'Leonardo DiCaprio' necklace to work is a good time, too, because customers just think I am a super creepy fan girl who kisses a life size cut out of Leo every night before bed. I knew a girl who used to do that with Joel Madden from Good Charlotte. So great. I think you may have the most beautiful eyes I have ever seen. I was doing a google search and your picture came up. Wow is all I can say.